Shock Van | NYMR – Levisham Station Group – The home of the Wombles! The van body is a ‘shock’ body i.e. 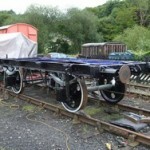 it is shorter than a standard body to allow it to move, slightly, on the standard underframe. It moves due to the fact it is built on a separate steel underframe, which sits on springs on top of the standard steel underframe. This design was used to help protect delicate loads from damage in transit. The body has had some minor damage repaired and plated over. It has then had a full repaint into late BR bauxite livery. Three of the doors have been replaced. The chassis is not the mate for this body. 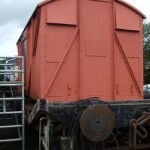 It is a standard box van body built by the LNER at Darlington in 1940. It has been blast cleaned and repainted. All the brakegear had seized solid and most has had to be cut off to free it. This has now been separated, cleaned and repainted and reassembled. The buffers have been completed dismantled and again cleaned before being put back together. The final securing of the body onto this new chassis is still outstanding.